Lagrange Points Are Five Point In The Solar System. There are 5 Lagrange point positions. 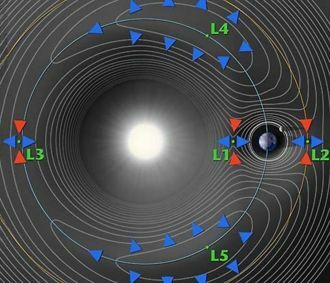 Lagrange points are the five positions in interplanetary space where a small object affected only by gravity can theoretically be stationary relative to two larger objects (such as a satellite with respect to the Earth and Moon). The Lagrange Points mark positions where the combined gravitational pull of the two large masses provides precisely the centripetal force required to rotate with them. They are analogous to geosynchronous orbits in that they allow an object to be in a "fixed" position in space rather than an orbit in which its relative position changes continuously. Lagrange points are also termed L-points, or libration points. A contour plot of the effective potential of a two-body system (the Sun and Earth here), showing the five Lagrange points. A more precise but technical definition is that the Lagrangian points are the stationary solutions of the circular restricted three-body problem. For example, given two massive bodies in circular orbits around their common center of mass, there are five positions in space where a third body, of comparatively negligible mass, could be placed which would then maintain its position relative to the two massive bodies. As seen in a frame of reference which rotates with the same period as the two co-orbiting bodies, the gravitational fields of two massive bodies combined with the centrifugal force are in balance at the Lagrangian points, allowing the third body to be stationary with respect to the first two bodies. History and concepts of Lagrange points. In 1772, the famed Italian-French mathematician Joseph Louis Lagrange was working on the famous three-body problem when he discovered an interesting quirk in the results. Originally, he had set out to discover a way to easily calculate the gravitational interaction between arbitrary numbers of bodies in a system, because Newtonian mechanics conclude that such a system results in the bodies orbiting chaotically until there is a collision, or a body is thrown out of the system so that equilibrium can be achieved. The logic behind this conclusion is that a system with one body is trivial, as it is merely static relative to itself; a system with two bodies is very simple to solve for, as the bodies orbit around their common center of gravity. However, once more than two bodies are introduced, the mathematical calculations become very complicated. A situation arises where you would have to calculate every gravitational interaction between every object at every point along its trajectory. Lagrange, however, wanted to make this simpler. He did so with a simple conclusion: The trajectory of an object is determined by finding a path that minimizes the action over time. This is found by subtracting the potential energy from the kinetic energy. With this way of thinking, Lagrange re-formulated the classical Newtonian mechanics to give rise to Lagrangian mechanics. With his new system of calculations, Lagrange’s work led him to hypothesize how a third body of negligible mass would orbit around two larger bodies which were already orbiting one another, which at specific points in its orbit would become stationary relative to one of its host bodies (planets). These points were named "Lagrangian points" in Lagrange's honor. In the more general case of elliptical orbits, there are no longer stationary points in the same sense: it becomes more of a Lagrangian "area". The Lagrangian points constructed at each point in time as in the circular case form stationary elliptical orbits which are similar to the orbits of the massive bodies. This is due to Newton's second law ( ), where p = mv (p the Momentum, m the mass, and v the velocity) is invariant if force and position are scaled by the same factor. A body at a Lagrangian point orbits with the same period as the two massive bodies in the circular case, implying that it has the same ratio of gravitational force to radial distance as they do. This fact is independent of the circularity of the orbits, and it implies that the elliptical orbits traced by the Lagrangian points are solutions of the equation of motion of the third body. A diagram showing the five Lagrangian points in a two-body system with one body far more massive than the other (e.g. the Sun and the Earth). The L1 point lies on the line defined by the two large masses M1 and M2, and between them. Example: An object which orbits the Sun more closely than the Earth would normally have a shorter orbital period than the Earth, but that ignores the effect of the Earth's own gravitational pull. If the object is directly between the Earth and the Sun, then the effect of the Earth's gravity is to weaken the force pulling the object towards the Sun, and therefore increase the orbital period of the object. The closer to Earth the object is, the greater this effect is. At the L1 point, the orbital period of the object becomes exactly equal to the Earth's orbital period. The Sun-Earth L1 is ideal for making observations of the Sun. Objects here are never shadowed by the Earth or the Moon. The Solar and Heliospheric Observatory (SOHO) is stationed in a Halo orbit at the L1 and the Advanced Composition Explorer (ACE) is in a Lissajous orbit, also at the L1 point. The Earth-Moon L1 allows easy access to lunar and earth orbits with minimal delta-v, and would be ideal for a half-way manned space station intended to help transport cargo and personnel to the Moon and back. The L2 point lies on the line defined by the two large masses, beyond the smaller of the two. Example: On the side of the Earth away from the Sun, the orbital period of an object would normally be greater than that of the Earth. The extra pull of the Earth's gravity decreases the orbital period of the object, and at the L2 point that orbital period becomes equal to the Earth's. Sun-Earth L2 is a good spot for space-based observatories. Because an object around L2 will maintain the same orientation with respect to the Sun and Earth, shielding and calibration are much simpler. The Wilkinson Microwave Anisotropy Probe is already in orbit around the Sun-Earth L2. The future Herschel Space Observatory and Gaia probe as well as the proposed James Webb Space Telescope will be placed at the Sun-Earth L2. Earth-Moon L2 would be a good location for a Communications satellite covering the Moon's far side. where R is the distance between the two bodies. This distance can be described as being such that the Orbital period, corresponding to a circular orbit with this distance as radius around M2 in the absence of M1, is that of M2 around M1, divided by . Sun and Earth: 1,500,000 km from the Earth. Earth and Moon: 61,500 km from the Moon. The L3 point lies on the line defined by the two large masses, beyond the larger of the two. Example: L3 in the Sun-Earth system exists on the opposite side of the Sun, a little farther away from the Sun than the Earth is, where the combined pull of the Earth and Sun again causes the object to orbit with the same period as the Earth. The Sun-Earth L3 point was a popular place to put a "Counter-Earth" in pulp science fiction and comic books - though of course, once space based observation was possible via satellites and probes, it was shown to hold no such object. The L4 and L5 points lie at the third point of an equilateral triangle whose base is the line between the two masses, such that the point is ahead of (L4), or behind (L5), the smaller mass in its orbit around the larger mass. L4 and L5 are sometimes called triangular Lagrange points or Trojan points. The name Trojan points comes from the Trojan asteroids at the Sun-Jupiter L4 and L5 points, which themselves are named after characters from Homer's Iliad (the legendary siege of Troy). The Sun-Earth L4 and L5 points lie 60º ahead of and 60º behind the Earth in its orbit around the Sun. They contain interplanetary dust. The Sun-Jupiter L4 and L5 points are occupied by the Trojan asteroids. Neptune has Trojan Kuiper Belt objects at its Trojan points. Saturn's moon Tethys has two much smaller satellites at its L4 and L5 points named Telesto and Calypso. Saturn's moon Dione has a smaller moon Helene at its L4 point. The giant impact hypothesis suggests that an object named Theia formed at L4 or L5 and crashed into the Earth after its orbit destabilized, forming the moon. 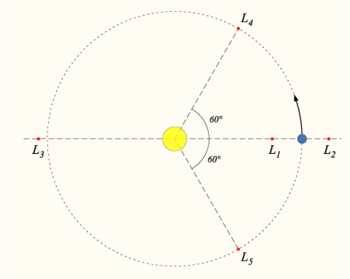 Although the L1, L2, and L3 points are nominally unstable, it turns out that it is possible to find stable periodic orbits around these points, at least in the restricted three-body problem. These perfectly periodic orbits, referred to as "halo" orbits, do not exist in a full n-body dynamical system such as the solar system. However, quasi-periodic (i.e. bounded but not precisely repeating) Lissajous orbits do exist in the n-body system. These quasi-periodic orbits are what all libration point missions to date have used. Although they are not perfectly stable, a relatively modest effort at station keeping can allow a spacecraft to stay in a desired Lissajous orbit for an extended period of time. It also turns out that, at least in the case of Sun-Earth L1 missions, it is actually preferable to place the spacecraft in a large amplitude (100,000-200,000 km) Lissajous orbit instead of having it sit at the libration point, because this keeps the spacecraft off the direct Sun-Earth line and thereby reduces the impacts of solar interference on the Earth-spacecraft communications links. Another interesting and useful property of the collinear libration points and their associated Lissajous orbits is that they serve as "gateways" to control the chaotic trajectories of the Interplanetary Transport Network. In contrast to the collinear libration points, the triangular points (L4 and L5) are stable equilibria (cf. attractor), provided the ratio of the masses M1/M2 is > 24.96. This is the case for the Sun/Earth and Earth/Moon systems, though by a smaller margin in the latter. When a body at these points is perturbed, it moves away from the point, but the Coriolis effect then acts, and bends the object's path into a stable, kidney bean-shaped orbit around the point (as seen in the rotating frame of reference). The L5 Society was a precursor of the National Space Society, and promoted the possibility of establishing a colony and manufacturing facility in orbit around the L4 and/or L5 points in the Earth-Moon system (see Space colonisation). Natural examples of Lagrange points. In the Sun-Jupiter system several thousand asteroids, collectively referred to as Trojan asteroids, are in orbits around the Sun-Jupiter L4 and L5 points. Other bodies can be found in the Sun-Saturn, Sun-Mars, Sun-Neptune, Jupiter-Jovian satellite, and Saturn-Saturnian satellite systems. There are no known large bodies in the Sun-Earth system's Trojan points, but clouds of dust surrounding the L4 and L5 points were discovered in the 1950s. Clouds of dust, called Kordylewski clouds, even fainter than the notoriously weak gegenschein, are also present in the L4 and L5 of the Earth-Moon system. The Saturnian moon Tethys has two smaller moons in its L4 and L5 points, Telesto and Calypso. The Saturnian moon Dione also has two Lagrangian co-orbitals, Helene at its L4 point and Polydeuces at L5. The moons wander azimuthally about the Lagrangian points, with Polydeuces describing the largest deviations, moving up to 32 degrees away from the Saturn-Dione L5 point. Tethys and Dione are hundreds of times more massive than their "escorts" (see the moons' articles for exact diameter figures; masses are not known in several cases), and Saturn is far more massive still, which makes the overall system stable. The Earth's companion object 3753 Cruithne is in a relationship with the Earth which is somewhat Trojan-like, but different from a true Trojan. This asteroid occupies one of two regular solar orbits, one of them slightly smaller and faster than the Earth's orbit, and the other slightly larger and slower. The asteroid periodically alternates between these two orbits due to close encounters with Earth. When the asteroid is in the smaller, faster orbit and approaches the Earth, it loses orbital energy to the Earth and moves into the larger, slower orbit. It then falls farther and farther behind the earth, and eventually Earth approaches it from the other direction. Then the asteroid gains orbital energy from the Earth, and the asteroid moves back into the smaller orbit, thus beginning the cycle anew. The cycle has no noticeable impact on the length of the year, because Earth's mass is over 20 billion (2 × 1010) times more than 3753 Cruithne. Epimetheus and Janus, satellites of Saturn, have a similar relationship, though they are of similar masses and so actually exchange orbits with each other periodically. (Janus is roughly 4 times more massive, but still light enough for its orbit to be altered.) 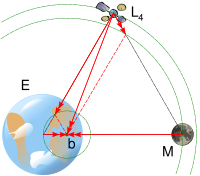 Another similar configuration is known as orbital resonance, in which orbiting bodies tend to have periods of a simple integer ratio, due to their interaction. Lagrange points are mentioned most famously in the science fiction film 2010: The Year We Make Contact, and the anime saga Mobile Suit Gundam. In the latter, clusters of space colonies (called "Sides") are located at the five Lagrange points of Earth, in addition to resource satellites and space fortresses. Lagrange Points have been mentioned in several other Gundam series as well. The Lagrange points are mentioned in science fiction from time to time (most often hard science fiction), but, due to the general lack of public familiarity with them, they are rarely used as a plot device or reference. The L5 Lagrange point is mentioned in L5: First City in Space, an early IMAX 3D movie. In William Gibson's novel Neuromancer, much of the action takes place in the L5 "archipelago", the location of many space stations. Lagrange points also play a role in the Larry Niven/Jerry Pournelle classic The Mote in God's Eye. The eponymous interplanetary relay station in George O. Smith's "Venus Equilateral" stories was located in the L4 point of the Sun-Venus system. In Robert Forward's Rocheworld the locations for Lagrange points around a binary planet are disscussed in contrast to typical system. The planet Troas in the stories "Sucker Bait" by Isaac Asimov and "Question and Answer" by Poul Anderson was located in the L5 point of a fictional Binary star system. In the Star Trek: The Next Generation episode, "The Survivors", the Enterprise is surprised by an enemy ship that had been hiding in a Lagrange point. The space station Babylon 5 is described to be located "at the L-5 point in a binary star system between a moon and a barren, lifeless planet." In the Independence War computer games, Lagrange points are used as the only locations for jump-points. In the Battletech game series, a star's Nadir and Zenith are the standard hyperspace jump points for most interstellar spacecraft. Lagrange points (usually the L4 and L5 points) are sometimes used to enter a system closer to planets, almost always for small-scale military or pirate operations due to the risk of catastrophic misjumps. In the PC video game Star Wars: X-Wing, Lagrange points are mentioned in the briefings of some missions that revolve around attacking objects placed at them. In the Xbox video game Halo: Combat Evolved (2001) and sequel Halo 2 (2004), Halo Megastructures play key locations throughout the games. In Halo: CE and Halo 2, the Halo structures are in L1 Lagrange points between the Gas Giants (and a moon) Threshold and Substance, respectively. In the Robert A. Heinlein novel The Number of the Beast, two of the main characters engage in a discussion of adding planets to the Solar System at Lagrange points. In Hideo Kojima's video game Policenauts, the setting of the game, an O'Neill model space colony, is located at the L5 Lagrange point. In the sci-fi series Stargate Atlantis there was a defensive Lagrangian satellite, which was most likely positioned at one of the Langrangian points. In the Hugo Award-winning novel A Deepness in the Sky by Vernor Vinge, a temporary human habitat is built at the L1 point between the planet Arachna and its primary star, a highly variable Dwarf called the On/Off Star. In Peter F Hamilton's Night's Dawn Trilogy, a ZZT jump drive cannot be used in a strong gravitational field. In the second book of the trilogy, The Neutronium Alchemist, the main characters cannot escape from a gas giant's gravity well before their pursuers catch up with them. Instead, they race to the Lagrange point between the gas giant and one of its moons in order to activate their drive. In the TV series Quatermass II, the hostile aliens live on a small asteroid "no more than half a mile across" at a "theoretical point of equilibrium" on the dark side of the earth, although neither L2 or Lagrange are mentioned by name (the term "Bieber Variation" is used instead).